Alpenglow on Stairway Icefall, Wrangell St. Elias National Park, Alaska. Well, this one will be the last of my current winter series. This is another photo of the Wrangell Mountains, Donoho Peak, and the moraine at the toe of Kennicott Glacier and Root Glacier. You can clearly see from the snow tha this is wintertime. No disputing that! What I really like about winter here is that I can shoot the sunset, alpenglow and be back for dinner. A few months ago I was up at 1:30am shooting sunset on Mt. Sanford on the north side of the park. This time of year it’s a little easier. I took this image of Stairway Icefall before 4:00pm! One of the things that most people who aren’t familiar with Alaska experience is the shifting of their sense of scale. Stairway Icefall here, is the ice wall sitting between the high lenticular cloud on the upper left third of the frame and the pointed peak glowing in the sunset in the upper right third of the frame. Stairway Icefall is a 7000′ vertical wall of ice. It’s about 15 miles from where I took this picture. It’s pretty amazing actually, to be standing looking at something seemingly so close, but so far away. It can be very disconcerting to hikers to learn that their intended destination is many more miles away than it appears – and often this leads to inexperienced hikers getting in trouble (and occasionally even some experienced hikers too!). What looks like an afternoon walk turns out to be a full on mission. The light this particular evening was amazing. I wish I had been in better shape to catch some of the compositions I’d seen on my hike up the valley earlier in the day, but with my leg hurting like it did, I was making a bee line back to camp and some hot cocoa! It was all I managed to stop, turn around, set up the tripod and fire off about 3 frames and then continue on. I’ll have to make another run up that way soon and try again. I’m actually really excited about shooting this area in the winter, because although I see it all summer long, the sun sets and rises so far further north in the summer that the mountains don’t get sweet light like this on this southern side of the range – the alpenglow is on the northern side of the mountains here in the summer. So this is the first time I’ve seen Stairway Icefall and these nearby mountains catching some warmer light. I can’t wait to get up to Kennecott (the town) and shoot Mt. Blackburn one cold clear winter dawn! For now, I must retire to bed. 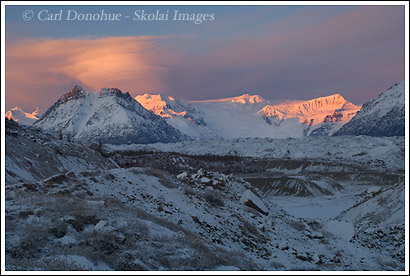 This entry was posted in Adventures, Alaska, Backpacking and Hiking, Landscapes, Winter, Wrangell - St. Elias National Park on November 28, 2007 by Carl D.
How do you take these foto very early in the morning with this low temperature. How’s life in Chile right now? That’s a beautiful image, Carl! Thanks for the compliment, I really appreciate that from you. It was a beautiful evening. I think, for now, I shall go back to my Chai Latté. Great image Carl – I can see how the magic of Alaska has taken a hold of you. Take care on that leg. Thanks for the kind words. It’s a great scene, any time of the year at this place .. I hope to shoot it a good bit more before too much longer! Yeah, AK’s got a good trip on me, particularly Wrangell St. Elias National Park – there’s simply no place like it anywhere. The leg’s coming on a LOT better thanks. Still kinda tight, but I’m stretching it and heating it up and it’s improving .. hardly even a limp any more.